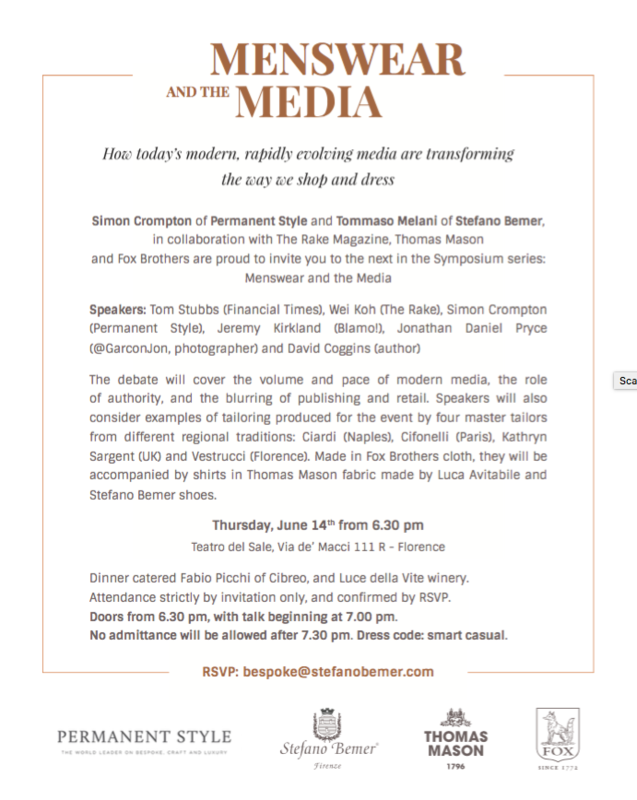 Details for our Media Symposium at Pitti. It's going to be such a laugh. Please do RSVP, as the places are a little limited by the theatre space and dinner. You can follow the discussion on The Media Symposium – please RSVP by entering your email address in the box below. You will then receive an email every time a new comment is added. These will also contain a link to a page where you can stop the alerts, and remove all of your related data from the site. Simon I would love to attend but couldn’t see a date listed anywhere – when will this take place? Thanks Simon, glad I wasn’t going insane..! I would love to attend the symposium as I will be going to Pitti for the first time and it would be great to be able to atten your event as well. Could I just send an email and RSVP? Thank you Simon and looking forward to meet you.